The past ten days has brought the United Nations of Music to the Twin Cities—and I am just referring to traditionally jazz venues and concert series. Appropriately it seems to have started with Regina Carter’s “Reverse Thread” project which was inspired by the violinist’s trip to Africa and particularly to her encounters with Mali musicians. Much of American music owes at least some of its foundation to African art forms, and during the concert at Ted Mann (March 15th), we were treated to what sometimes sounded a bit like American bluegrass, modern jazz, and a touch of Latin. In addition to the violin, our attention was drawn to the kora, skillfully manipulated in the hands of Mali magician Yocouba Sissoko. At a pre-concert presentation, he described the making of the instrument from a large gourd with 21 strings (ten on one side, 11 on the other). The sound is something akin to a dulcimer without the hammer strike, and watching each hand stroke and slide across its respective set of strings, one might think of a weaver as much as a string artist. 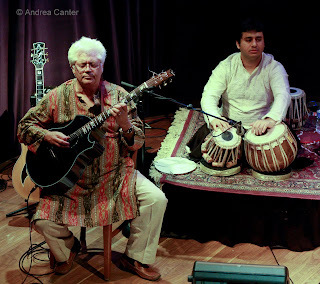 Two nights later, at the Dakota, I caught the late set of Larry Coryell’s Bombay Jazz. A native of Texas himself, fusion guitar idol Coryell has assembled another type of fusion, bringing native Indian traditions of tabla and bansuri (wood flute) together with Eastern-focused American saxophonist George Brooks and his own very American electric guitar. The result seems to be neither entirely East nor West but bits of each woven into a hybrid fabric of interesting sound. Ronu Majumdar surrounded himself with flutes of varying sizes, looking more like recorders but played horizontally like the Western metal flute; his style was flamboyant and virtuosic. Young tablist Aditya Kalyanpur would be a welcome addition to a Latin percussion ensemble. Some of the most interesting efforts of the set were on a blues composed by Brooks. Definitely not an Eastern groove. Sunday brought an unusual opportunity to hear one of the most accomplished of modern Israeli jazz artists, pianist Anat Fort. Fort was in Minnesota to perform in Lanesboro—her second visit there while only her first to the Twin Cities. A classmate of bassist Adam Linz at William Patterson College in New Jersey some 15 years ago, Fort was invited to present a public workshop at MacPhail in the afternoon, followed by a trio concert and supported by jazz coordinator Linz and JT Bates. 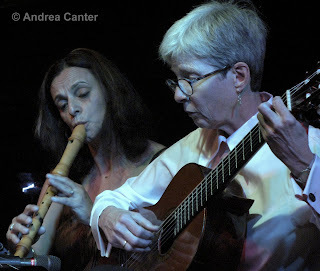 I don’t know if there is truly an “Israeli” approach to jazz or piano; Anat’s spacious lines and extended harmonies seem consistent with some of the pianists I associate with European jazz and ECM, yet there also seems to be a strong connection to the pioneers of the American avant garde, like Cecil Taylor, and an underlying affinity for blues and ensemble collaboration a la Keith Jarrett. The trio played but two tunes during two hours of frank and entertaining discussion of the art of composing, the confinement of formal instruction, the spiritual relationship between musician and instrument. The second composition, “Something About Camels,” was a showcase of that relationship, each musician using his or her instrument in somewhat atypical and creative ways—Anat reaching deep into the piano to coax an array of sound from the strings; Adam tapping his bow against the very top of the bass neck for muted percussive effects, then dragging the bow across the very bottom of the strings—below the bridge; JT sitting on the floor leaning over a large cymbal and drawing, scraping, sliding across to elicit a series of groans and growls. From this introduction, the trio then settled into a far more melodic, more traditionally rendered post bop reverie, only to return to their earlier antics to close it out. And it was hardly noise, but oddly beautiful. Last night a sold-out crowd greeted Arturo Sandoval at the Dakota with nearly as much enthusiasm as the Cuban expatriate exuded throughout two sets. 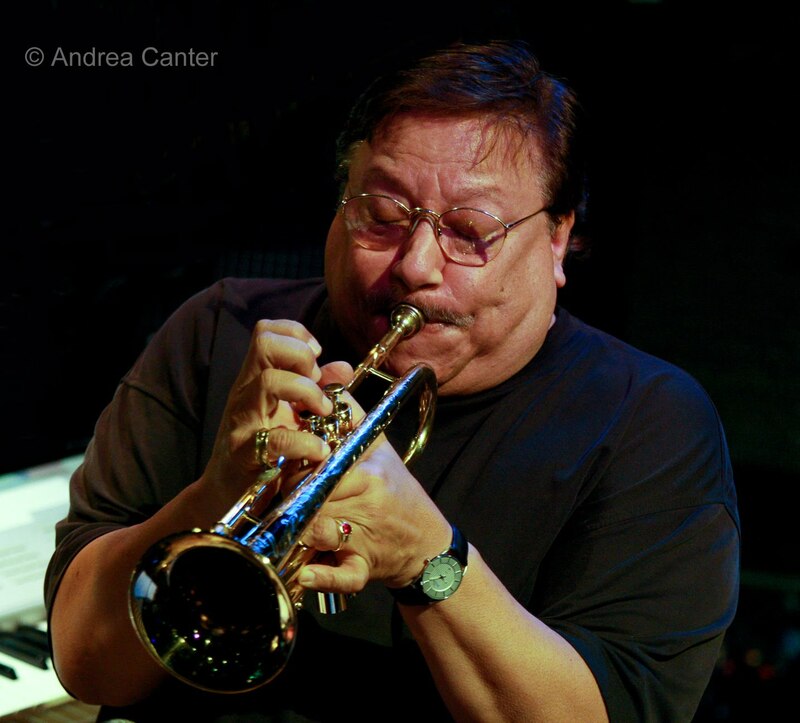 Not only does Sandoval bridge the duality of Latin and bebop (and a little hip-hop), he plays multiple roles within the band, on trumpet, flugelhorn, electronic keyboard, snare drum and acoustic piano. And, oh yes, vocals—he sang a tune in each set, including a pleasantly gritty “Estate” in his not-native Italian, sprinkled elegantly with flugelhorn snippets. The sets included the expected Latin fervor but also some straight readings of American standards from Miles Davis and Clifford Brown, and a lovely piano rendition of “Smoke Gets In Your Eyes.” Most of the evening, the piano belonged to Manuel Valera, also a Cuban musician now based in the U.S., also culturally ambidextrous. Not a public performance but 100 seniors can’t be wrong: The cultural exchange continued this morning on the St. Thomas University campus, where Joan Griffith is again teaching about jazz in the “Senior College” spring semester. This is a second edition of her “Conversations About Jazz” – two-hour open-ended interviews and musical collaborations with a different artist each week. And not strictly limited to “jazz” artists, as today’s guest was recorder master Clea Galhano. A native of Brazil who studied in The Netherlands and at the New England Conservatory, Clea is internationally known as an expert in early and Baroque as well as modern music, and of course is well versed in the music of her homeland. Here in the Twin Cities, she has found a soulmate in Joan Griffith, who has never set foot in Brazil but has managed nevertheless to develop a Brazilian heart. Capping some years of joint musical efforts, the two recently joined multi-lingual vocalist Lucia Newell to record a luscious set of songs written by the grand masters of Brazil and our local grand dame of samba and baiao, Joan Griffith. This morning, they played some of that repertoire as well as some Bach and Telemann, making very clear that (in part) the origins of improvisation go back to 17th century Europe. Sometimes I think that only in the melting pot of the Twin Cities could you find a Brazilian-born, Dutch and Boston-trained recorder player and a Nebraska-born guitarist who writes Brazilian music on the stage of a Catholic university lecture hall entertaining a hundred senior citizens with music born of a South American folk tradition linked to African tribal rituals and the 17th century slave trade. Call it the universal nature of that Reverse Thread. Joan Griffith, Clea Galhano and Lucia Newell will release "Circle of the Dance" on Sunday afternoon, April 25th at the Commodore Hotel in St. Paul.